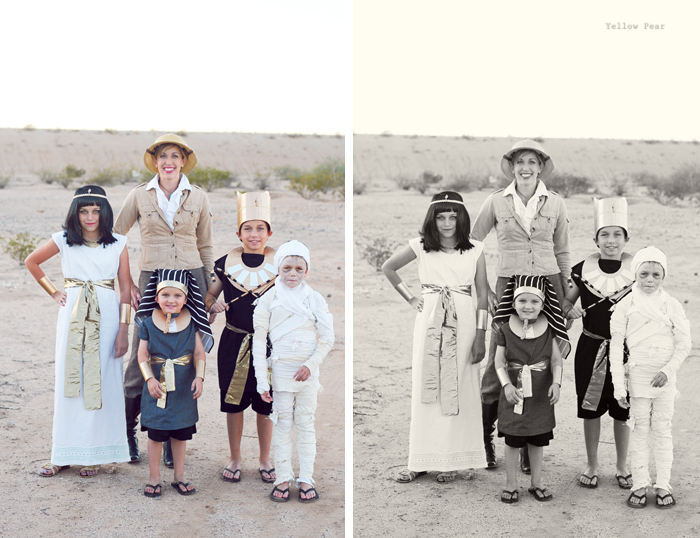 After much deliberation, discussions and various failed plans, we settled on an Egyptian theme for Halloween 2012. Miss B has been studying Cleopatra and Mr. C and I have both been reading books dealing with Egyptology, so it was perfect. This marks our family's TENTH anniversary of themed Halloween costumes. I can't believe it. 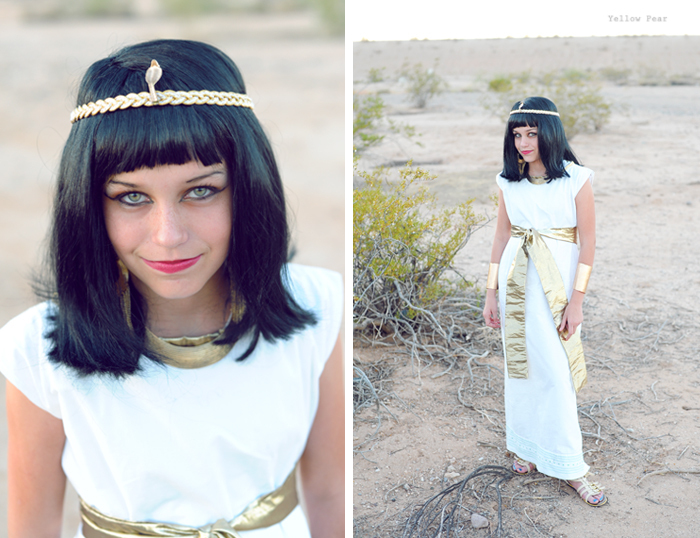 Miss B's choice of Cleopatra was obvious. Her costume came together nicely with a borrowed wig that we gave a haircut, a $3 sheet from Goodwill, some gold braid, a cobra head spray-painted gold, some gold jewelry, gold toilet paper tubes for arm bands, dramatic makeup, gold sandals and a gold sash. I've really enjoyed Elizabeth Peter's Amelia Peabody series lately, so I was excited to go as Amelia herself, who is a sassy Egyptologist in the early 1900's. 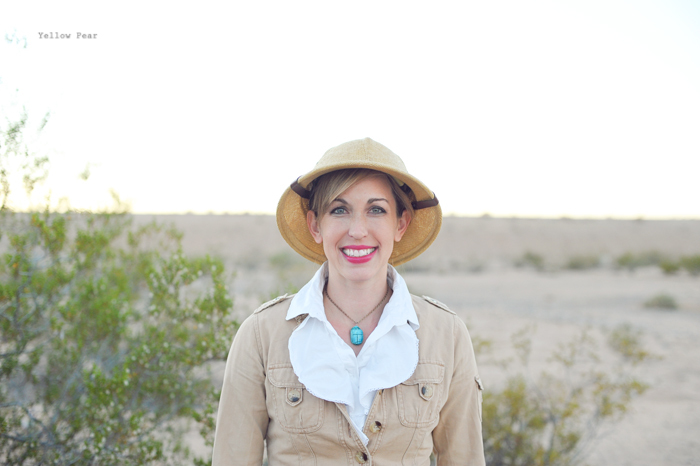 My big purchase was the pith helmet. I found a blue scarab bead on Etsy and made myself a necklace, then found trousers at Goodwill, pulled the boots and jacket from my closet and borrowed the frilly shirt. Amelia uses a parasol in the books as protection from sun and villains...hence the parasol. Mr. C originally wanted to be Horus (the Egyptian god), but I wasn't up to making a falcon head, so he decided on Akmenrah, from Night at the Museum. I was scared about the giant gold crown, but it turned out to be pretty easy. I just rolled a big piece of cardboard into a tube and cut it to fit his head, then cut around his forehead and ears. I cut out the top sides at diagonals and then inserted a circle to cover his head. If that makes sense. I then added a gold ribbon and another cobra, and spray painted the whole thing, along with his cardboard collar, arm bands and the dowels for his crook and flail. For the stripes on the crook and flail, I used electrical tape. I made his "tunic" out of some cheap black fabric (we must call it a tunic, not a dress) and used my standby Halloween pattern, which is a rectangle with arm holes and a slit for the head. So sophisticated. I used the same pattern for Q and Miss B as well. 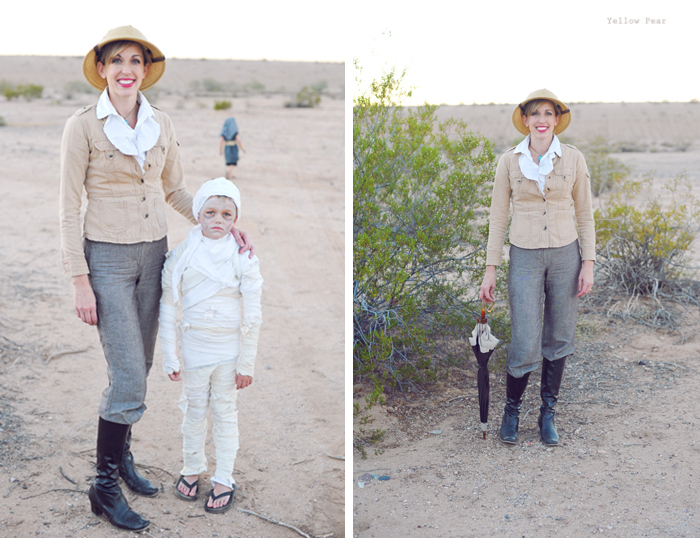 Q was originally going to be a mummy with Dennis, but after his costume debacle at our church's Trunk or Treat, I decided we had to start over. The thing is, the kid is a jumping bean. He never, EVER stops jumping and bouncing...so even though I glued, pinned, tied and wrapped his mummy wrappings, he bounced them clean off. I spent the entire night, re-wrapping him, trying to keep him from tripping, and pulling up his loose wrappings so you couldn't see his undies through the white tights he was wearing. It made for a busy and stressful evening. So I came home and straightaway made plans for another costume. 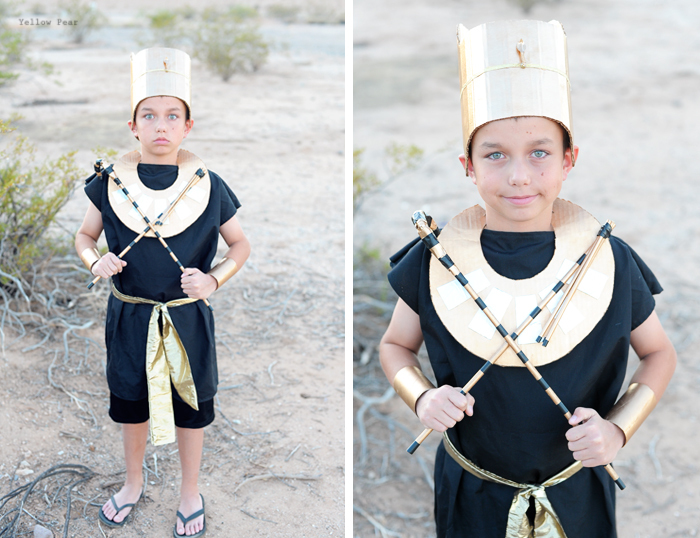 We decided on King Tut and I put it together Monday and Tuesday. 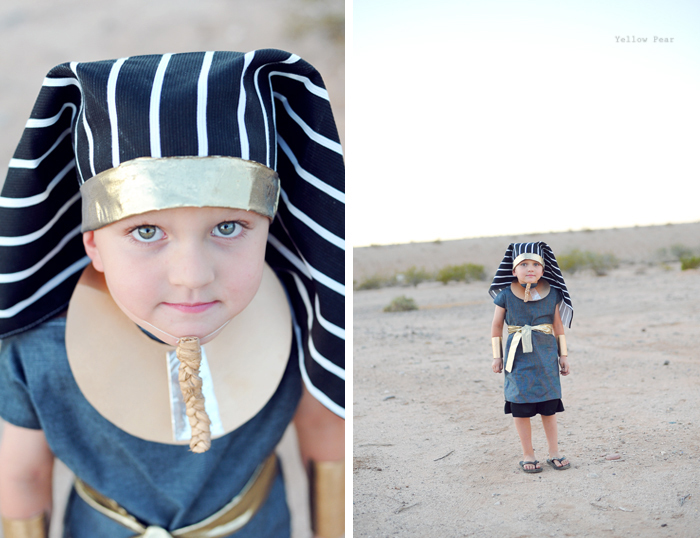 Out of existing fabric, I made him a grey tunic, a headdress and gold sash. I sprayed another pair of toilet paper tubes gold, made a mini golden collar (with aluminum foil accents), and finally a golden beard. I needed another cobra, but couldn't find one last minute. He wore basketball shorts underneath his tunic, just like Mr. C. I thought he made an adorable King Tut and the beard cracked us up. 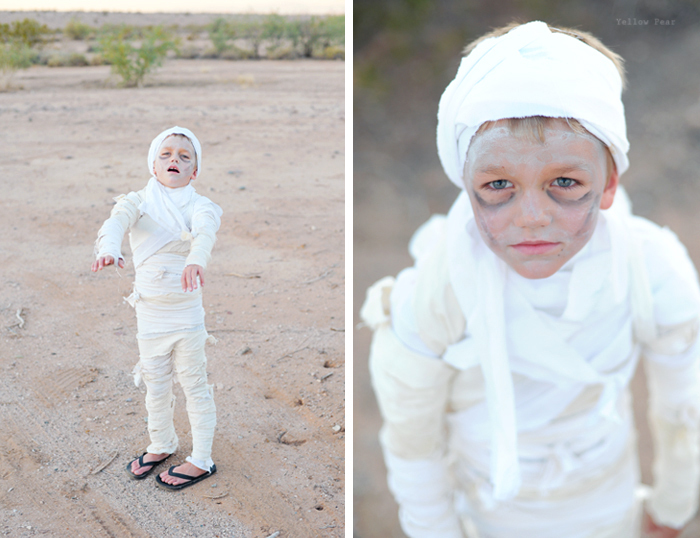 Dennis was our very own mummy. And I will never try my hand at mummy wrapping again. It is hard to wrap it durable enough to withstand a night of walking door-to-door, but yet realistic looking as well. It also takes forever. He made it through the night with plenty of candy and a good time, so that's all that counts. And it was very cheap, I just used leftover fabric scraps. Here's a behind-the-scenes shot of two pharaohs playing tic-tac-toe in the dirt with a mummy while their archaeologist mother tries to round them up for their respective photos. Ha. And there you have it. Deliberations have started for next year's plan. Love the costumes! I love Q's beard, so cute!! Gosh! This may be my favorite of the yellow pear halloweens so far. Please let ms B know she is absolutely gorgeous. How'd u trick her dad into letting her go out like that? I LOVE how into character the boys got I their shots, Dennis' wrappings look fantastic & both C & Q look amazing. PS you are an amazing Amelia, where is her husband though? Ugh I forgot his name...in the book...not ur real life husbands name, I know that. :) So fun!!!! So glad Dennis didn't have to go potty - where would you even begin? Everyone looks great!! Trunk or treat should start a costume contest just so your family can win it! AMAZING! You are so brilliant and talented! Great pics of your costumes, I'm glad there are other people out there who enjoy doing Halloween themes and dressing up : ) So cute. How did you make the headdress for Q? I love this theme. My 3 month old is going to be a mummy this year and my hubby and I will be Cleopatra and King Tut. It was very simple! I just sewed the strip of folded gold fabric to the edge of the striped fabric. I didn't even hem the striped fabric and just wrapped the whole thing around his head and pinned it together at the base of his neck. Hopefully that makes sense!